Now everyone knows I am an Apple fanboy. I admit it. However, I must confess that the iPhone falls far too short for my requirements. The cost, lack of 3G and the endless struggle for third party apps means it fails to scratch my itch. Perhaps most significantly the lack of IM and VOIP makes it a non starter for me. 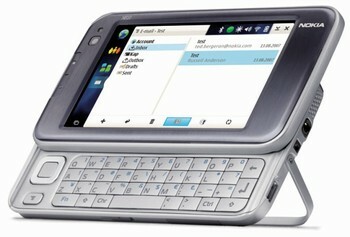 Now, I did consider the Nokia E90 communicator as the holy grail. An all in one device that pretty much covers all the requirements. However, it has limitations. A screen that, whilst big, falls short when trying to render the latest 2.0 sites, along with other sites. Well it looks like my wait is over. Nokia have released the latest in their line up of Linux based Internet tablets. The N810 covers all my requirements (bar mobile telephony). Quite simply, the spec is awesome. Go check it out here . I want one. So the hot news from Apple is that OS X 10.5 is due for release on Friday 26 October. It promises to be a significant OS with over 300 new features. Perhaps some of the most noteworthy include ‘Time Machine’ an innovative approach to back up for the typical user. Other call features include a radically enhanced iChat, cover flow view on all files and a cleaver way to remotely connect to your Mac via .mac. I know I’ll be grabbing my copy from Regent Street next week. I can’t wait. ADSL Gateway/router to the internet. The basics are there. Now the task in hand is three-fold. consuming – due to the 512k link. machines. Bandwidth limitation, proving, the main constraint. cyber cafe with just two primary client computers. all three computers. Then the next step. was to be the key. from intuitive. Failed. The search continued…..
software on the client computers. A no brainer so far. essentially, the server controls all aspects of the clients. simultaneous shutdowns were all possible via the server. revert to its standard settings after each session. potentially difficult stage very easy. training would be had via the IT trainer. be a success – and I wish them well. post-project review in January next year. presented a number of challenges which I will identify later. project and how I went about setting it up. would be used for the project. serve as both business case and project initiation document. the cyber cafe the day I arrived there. enabled ready for use when I got there. for the arrival of the computers. they were in full working order. on the cyber cafe managers desk. was time to set up the ADSL and networking. officially the first FON social router in Mauritius! connected via ethernet cabling to the Gateway/router. Gateway/router, specifically, setting up the ADSL connection. based, using the routers IP address as the entry point in. to spell out the username to me again. Well what do you think so far? Feel free to comment below.